perhaps it’s because of a recent art class, but I’m looking at the monster bruise on the heel my hand and feeling awe at its beauty. 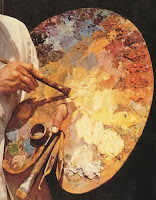 The learnings from my art class brought into my awareness the multitude of colors that are present in skin tones. When Tessa Nunn – my oil-on-canvas teacher – described the process of painting skin it involved observing a spot of skin (with all the shadow, lighting, reflection and so forth that favors the dermis to reveal its true tones) finding or mixing that that color within my palette and then painting that one point on the canvas figure with that color. It’s the culmination of those spots that make the skin tone – no blending required. i guess that’s why the Crayola coloring of my youth looked so odd. no one has an exclusively peach colored flesh tone. Duh. so obvious now. Last night I went skating with my friend Steffi D and whoopsy daisy I ‘banana peeled’ right onto my left hand with a heavy thud. I fell hard, and frankly I think I’m quite fortunate that I didn’t break anything. After the endorphins wore off and the cold of the evening set in, my palm began to throb. A hot pulse surged behind chilled skin. fast forward to today, and it really just looks more traumatic that it is. mostly it’s just a gorgeous bruise with amazing colors – not unlike a romantic sunset or the snow glow @ dawn. Looking down at my hand – focusing in on a point finding new shades and hues and splotches – I feel inspired to paint this beautiful boo-boo before it quickly heals away. Who knew a bruise could be so entertaining?